Photos by ALive Coverage, courtesy of Buku Music + Arts Project. In New Orleans, the month of March is full of citywide events surrounding Mardi Gras and St. Patrick’s Day celebrations. One big and often overlooked event, is BUKU Music + Arts Project, NOLA's premier urban festival. As someone who has attended and worked the festival for six years since it began, I've seen, first-hand, the passion that goes into curating such an amazing event. I would recommend BUKU to anyone in New Orleans, and those who are looking for a reason to visit. The two-day festival happened on March 10 and 11, located on the banks of the beautiful Mississippi river at the famous Mardi Gras World factory. The festival offers a diverse lineup each year, with genres ranging from EDM to hip-hop to jam bands and rock-n-roll musicians. Buku offers six beautiful stages stacked with state-of-the-art production offering a unique tie to New Orleans. One of the coolest things about BUKU is the amount of New Orleans culture seen throughout the festival. From the New Orleans skylines to the pop-up artists, to the raging Mississippi River right next to the festival, Buku makes it hard for patrons to forget they are in The Big Easy. — Taran Cornejo, Buku Grassroots Marketing Manager. The Power Plant Stage is the main stage for the festival and is set outside along the Mississippi River with the Market Street Power Plant as the backdrop. The old power plant is a significant landmark in New Orleans and is now a branded part of BUKU’s graphics. Some of the acts that performed on the stage this year included Travis Scott, Tycho, Run the Jewels, and Deadmau5. The Float Den is another big stage at BUKU, and is located in the warehouse where Mardi Gras World curates the floats for New Orleans Mardi Gras parades. Patrons only have to glance around the room to find huge, beautiful floats lining the perimeter of the warehouse. Some acts this year performing on the Float Den Stage included Zeds Dead, Zhu, and Cashmere Cat. One of the coolest stages in my eyes this year was the Back Alley stage set right next to the Mississippi River with the Crescent City Bridge directly behind in view. This stage was made entirely out of industrial culvert piping, giving it an almost intergalactic vibe to go along with musical artists. The piping used to build the stage is significant to New Orleans, as the underground drainage system beneath the entire city is built using this type of piping, a cool little connection to our beloved city. The stage acts as one of the smaller more intimate stages, but at any time throughout the festival you could find it packed with die hard fans. The other stages at the festival include the Ballroom Stage, the Front Porch Stage, and the VIP stage on board the Creole Queen Riverboat exclusive to VIP ticket holders only. 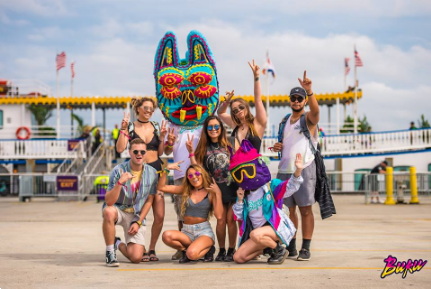 Not only does BUKU Music and Arts Project bring a killer artist lineup each year, but it integrates itself into the New Orleans culture in many, more unrecognizable ways. The festival features hundreds of “pop-up” performances by street performers gathered from the city; some include a group of break dancers called The BUKU Breakers, a moving robot dancing cart, and even New Thousand, an amazing local band that performs on Frenchman year round. These special moments throughout the festival give patrons a taste of performances that happen throughout the crescent city. Another way that BUKU acts as a showcase for local talent is through the Graffiti scaffold wall placed in front of the main stage. The installation features 14 local graffiti artists whose art appears all around the city such as You Go Girl, Achoo, and Sweetalk. The artists paint live murals as the festival goes on and at the end of the festival the murals are auctioned off and the money is given to Upbeat Academy and Animal Rescue New Orleans (ARNO). Upbeat Academy is a nonprofit organization run by Winter circle Productions, the curator of BUKU, and helps teach underprivileged kids how to produce music. Buku is always giving back to the city. BUKU incorporates local DJ’s into their lineup to help up and coming artists gain exposure. This year, Buku hosted Dohm collective, SFAM, and Community Records, all of which are local talents. The Front Porch also provided a stage for Upbeat Academy to showcase their student's skills. All of the components of BUKU Music and Arts Project make it a festival that encompasses a not so well known culture that exists in the city year round. It’s a culture dive in the form of a music festival that isn’t just focused specifically on the national artist that are playing. Each year the festival gives back to New Orleans by showcasing hidden talents within the city. This festival is slowly becoming one of the staple events in New Orleans. Only on its 6th year of existence, the festival has sold out three times and continues to grow in production and decor each year. BUKU would not be possible without all of the dedicated fans that have and will continue to attend year after year. One of the most important factors for success is the incredibly talented staff of teams that help curate the creative festival. There are so many events that happen in New Orleans year round, and BUKU Music and Arts Project should be in the top five events to attend in the Crescent City. Head on over to Buku’s Facebook and Instagram and give them a follow to stay up to date with everything BUKU and until next year, Merci BUKU!